What do Africans think about China? How does this compare with the US? I get asked these questions a lot, and I always try to resist responding with anecdotes along the lines of: "a taxi driver I spoke with in Ethiopia believes X about China/the US." The best data we have will be found in public opinion polls. Below is a quick survey of polls I know about. If readers have links to other polls, I'd love to include them. The Afrobarometer asked a public opinion question on China in 2008 but I don't think they've repeated it. In that survey, 47% thought that China "helped somewhat" or "helped a lot" while 30% answered "don't know". For the US, 54% thought we "helped somewhat" or "helped a lot" and 29% didn't have a response. The BBC regularly does a World Public Opinion poll (PIPA) asking some comparative questions on China, although their coverage of African countries is spotty. Their survey in 2011 had five African countries, Kenya (73% positive), Nigeria (85%), Ghana (72%), Egypt (55%) and South Africa (53%). All had at least 50% positive rating. Another BBC survey in two African countries in 2011 reported a positive view of the impact of China's growth on their country: Kenya (77% positive), Nigeria (82%). In 2013, the PIPA survey showed positive ratings of 78% for China in Nigeria, 68% in Ghana, and a decline to 58% in Kenya. Their 2014 survey showed a rise in favorable public opinion on China in Kenya (65%), stable in Ghana (67%) and a bit of a positive jump for Nigeria (85%). The Pew Charitable Trust also includes some questions on China/US public opinion. I think the most recent Pew survey took place in the Spring of 2013. The table from the US/China question is reproduced to the right. On average, 65 percent of Africans viewed China favorably, and 73 percent the US. Earlier Pew surveys on this topic seem to have only included one country, Kenya. In 2010, 94% of Kenyans surveyed viewed the US favorably and in 2011, 83%. In the table on the right we can see a favorable opinion for the US of 81%, In 2010, 86% of Kenyans surveyed viewed China favorably, and in 2011, this dropped to 71% and in 2013, it rose to 78%. The Paul H. Nitze School of Advanced International Studies (SAIS) SAIS China Africa Research Initiative (SAIS-CARI) announces a call for papers for a Conference on China's Overseas Finance and Aid, April 10 and 11, 2015. 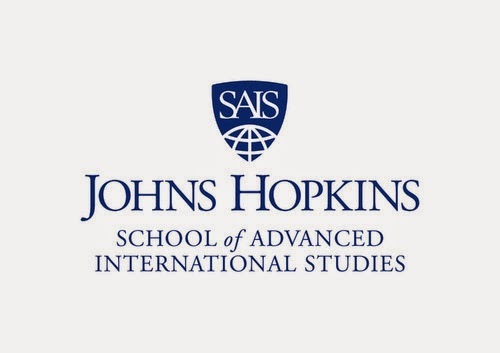 The SAIS China Africa Research Initiative (SAIS-CARI) will hold its second public conference on April 10, 2015 with a private researchers' workshop on April 11, 2015, in Washington, DC at Johns Hopkins University’s School of Advanced International Studies (SAIS). The theme will be Researching China’s Overseas Finance and Aid: What, Why, How, Where and How Much? The goal will be a deeper, comparative understanding of the rise of China's state-supplied overseas finance, including grants, foreign aid loans, commercial loans, export credits and special investment funds. Papers will examine the motives and modalities, trends, sectors, and impacts using a variety of methods from quantitative analysis to case studies. We are pleased to announce a Call for Papers for this conference and workshop. Proposals can be submitted at any time but are due by February 1, 2015. The list is for suggestion only; other topics are also welcome. We especially welcome papers that are based on fieldwork and focus on case studies of specific projects. Applicants are welcome to discuss their proposed research with the conference organizers before making a proposal. 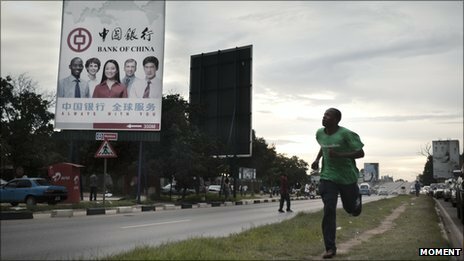 Comparisons between Chinese and other financiers and donors would be particularly welcome, or comparisons between Chinese finance in Africa and in other regions (including China). Prospective authors should submit a two page proposal to SAIS-CARI@jhu.edu by February 1, 2015. Proposals should include a 500 word abstract of the paper, a brief description of the research project and methodology, and a short biography of the author. We may request other information. Researchers whose papers are accepted will be provided with two nights accommodation and meals during the conference. A limited amount of travel support will be available for selected researchers to attend the conference. Authors should indicate whether they need travel support in order to participate. We've seen a lot of discussion of the news media coverage of the new report by the Environmental Investigation Agency of the criminal ivory smuggling racket and its claims of Chinese diplomatic involvement in this criminal activity. Anthropology Professor Stephanie Rupp at the City University of New York is an expert on these issues, and a China-Africa hand. I asked her if she would give us a guest post for the blog.In the wake of recent claims regarding officials from the Chinese government’s involvement in ivory smuggling, the impact and demand of China for elephant ivory has once again come to the fore. A recent report released by the Environmental Investigation Agency (EIA) catalogues the impact of Chinese criminal syndicates and Tanzanian corruption in the ivory trade. This report dovetails with other research indicating that Tanzania – and the ports of Dar and Zanzibar – provides a significant point of exit for ivory aggregated by means of networks that criss-cross the continent. It is important to emphasize that the ivory trade is a complex network that spans multiple nations in both Africa and Asia, a point that is indicated, but not emphasized in the EIA Report. In the Congo River basin, where my research is focused, elephants have been aggressively targeted with a marked surge over the past decade. Indeed just this week 256 elephant tusks were confiscated in southern Cameroon. When I returned to my research site in southeastern Cameroon on the border with the Republic of Congo in the summer of 2014, the price of ivory in had increased tenfold over the past decade, from $40/kilo to $400/kilo. The urgency of the situation for elephant populations throughout the continent is clear: elephants in both forest and savannah contexts are under severe pressures from poaching. On the Asian side, Thailand is the second-leading destination of African ivory after China. When I went to Thai markets to look for ivory during the summer of 2013, it was apparent that Thai markets are awash in ivory. Most of it appears to be “new stock,” ivory harvested after the 1989 CITES ban on international ivory trade. The CITES ban prohibits the trade of ivory across international boundaries, but not within particular nations – such as Thailand, India, or Zimbabwe, for example – that host elephant populations. Given the state of deterioration of the Thai national elephant herds, the relatively paucity of ivory on Asian elephants (only males produce tusks), and the proliferation of ivory networks throughout both African and Asian nations, new stocks of ivory in Thai – and other Asian markets – are likely to be from Africa. Numerous governments – the US, France, the Philippines,and China -- have staged the very high-profile destruction of ivory. For the most part, these public performances of ivory destruction are media events designed to signal the state's official line in cracking down on ivory poaching. While these events signal important official recognition of the issues of ivory markets, such events are primarily public performances that may well allow trade in ivory to continue. The issue of direct government involvement in the specific visit by the Chinese delegation in 2013 needs additional – and rigorous – substantiation. Evidence for involvement by Chinese government in exporting ivory through this official delegation comes from Tanzanian carvers who supplied carvings (ebony, ivory, or both) to the delegation.While particular relationships between international “officials,” business people, or travelers and particular artisans would not seem unusual, such specific ethnographic comments require substantiation. Moreover, the idea of “Chinese” pressures on African elephant populations has to be much more carefully disaggregated: participants in contemporary ivory networks hail from multiple nations in addition to China. Even in EIA report highlights the involvement of actors in Malaysia, Sri Lanka, the Philippines, Thailand. Though the primary destination, China is not the only end-market for ivory. The plight of elephants today is a result of many centuries of human exploitation of these animals for their ivory. The last surge of demand (only one of many) spiked about a century ago, when consumers were the nouveau riche of the Gilded Age in North America. At the end of the 19th century, approximately 95% of all ivory leaving Africa left through Zanzibar, bound for New England ports and ultimately for elite markets in cities such as New York City, Philadelphia, and Boston. Piano keys, billiard balls, hair combs, handles on knives and revolvers: elite commodities drove the hunting of the largest “tuskers” in East central, and southern Africa a century ago, with detrimental affects on the population size and genetic pool of elephants that remained in the 20th century. Today's pressures on elephants, driven again by a surge of consumption of elite commodities by another nouveau riche – this time in Asia – needs to be seen in the context of this larger global history. Taking a larger historical view helps us see that contemporary ivory networks rest on cultural values and historically deep pathways that are multiregional and multicultural, and should not devolve into “China-bashing.” This perspective allows us to break through the facile dichotomies such as “China-Africa” and “Chinese traditional vs. Western liberal values” to appreciate the global complexities of cross-cultural appreciation for ivory, and the long-term multifaceted pressures that this appetite for ivory exerts on elephants. Thought I would share an interview I did last week with Young China Watchers (YCW), which is "a dynamic group of young professionals seeking to foster the next generation of China thought-leaders. Through regular roundtables and talks with senior figures in the China academic, policy, and business communities, and through original interviews and feature articles, it provides a chance for engaged individuals to interact and discuss the most pressing issues emerging from China today." Click here for the interview, where you can also see the latest version of the cover of my new book! And as we’ve seen recently with the Ebola epidemic, China has also shown that it is prepared to take on a bigger role in addressing international crises – including those that emerge far from Asia, even those on the opposite side of the globe. We’re very grateful that China has committed more than $130 million to date in aid and supplies to help address the Ebola crisis. And last week, China announced its plans to dispatch a unit from the People’s Liberation Army to Liberia to help manage the crisis. That’s global leadership, and it’s important, and that cooperation with us is more than welcome. It's not been easy for the US and China to build a cooperative relationship in Africa. Much more could be done in fighting Ebola together -- a good place to build some positive guanxi among Americans and Chinese in Africa. Looking into oil exports from Africa today -- an intern wrote up a story on a recent talk I gave. She sent me a draft, and I saw that she had mistakenly heard me say that China was taking 90 percent of Africa's resources (what I had actually said was that natural resources and commodities make up 90 percent of Chinese imports from Africa). I know a lot of people still believe that China is vacuuming up the vast majority of Africa's resource exports. So what is the data? Let's look at oil. According to the US government's Energy Information Administration (EIA) China is importing 22% of sub-Saharan Africa's oil. Thanks to fracking and shale gas, the US has cut way back on sub-Saharan African oil. We only imported 13% of SSA's oil exports in 2012. Europe gets the most: 28%. So, China imports 22% of sub-Saharan African oil and "the West," 41%. What about North Africa? The major producers there are Libya (Europe has 71%, China has 12%, the US 4%) and Algeria (Europe gets 72%, "Asia" gets 10%). If this was added to the totals, China's percent would shrink and Europe's would expand. China is a big consumer of African resources -- timber, cotton, copper -- but as far as oil, it is still quite a bit smaller than "the West". The Financial Times tongue-in-cheek "Danwei Model Workers" list of websites on China honored the excellent China Africa Project in its "Model Worker of the Year (Podcast)" awards today. I love what the China Africa Project is are doing. Always lively, always worth checking out. 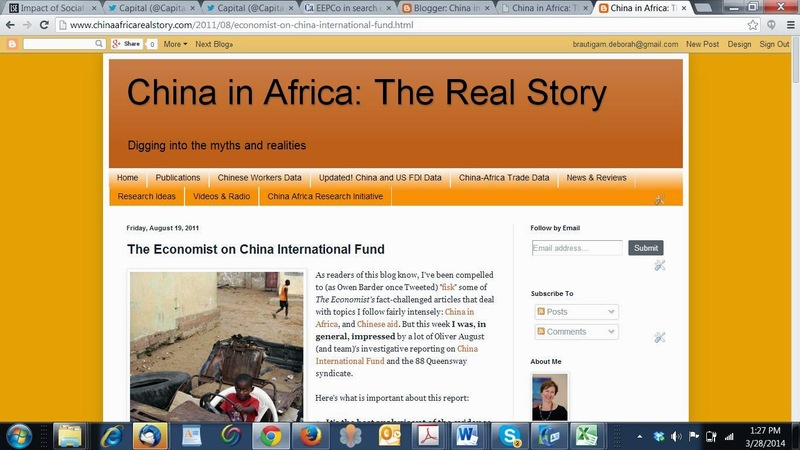 I am also pleased -- even though I haven't been blogging much as I focus on my new book -- that the Financial Times once again retains China in Africa: the Real Story blog on their "Model Worker" list of the best websites on China -- the only China in Africa website to make the list. This year they also include a Twitter list, which honors the indefatigable Winslow Robinson and the China Africa Reporting Project at Witts. China is still a relatively new player in African resource investments. Given the poor social and environmental record of Chinese mining and oil companies at home -- and the challenges that face most companies operating in these sectors in Africa (think: Shell in the Niger Delta) or even off the shores of the United States (think: BP in the Gulf of Mexico) Chinese companies have had a steep learning curve about the risks of "going global". Global Witness has come out with a helpful new report on one aspect of these risks: complicated new laws that prohibit the import of minerals from conflict zones, and require source tracing: "Tackling Conflict Minerals: How a New Chinese Initiative Can Address Companies' Risks." The report is timed to coincide with the launch of (un)official new guidelines on responsible supply chain management in conflict-affected countries put together by the China Chamber of Commerce of Metals, Minerals and Chemicals Importers and Exporters (CCCMC) the major Chinese business association grouping mineral import/export companies. It uses the DRC as a case study. The guidelines themselves are being released today and I will provide a link when available. They were developed with assistance from the German development agency, GIZ. Bravo to GIZ and Global Witness for good, practical work. I hope you plan to translate the report into Chinese so it can have impact in the right places! As many readers know, I am writing a book on China's agricultural investments in Africa. One of pieces of conventional wisdom I am questioning is the assumption that China wants to source its food in Africa. It's clear from detailed COMTRADE trade data that China actually exports far more food to Africa than the reverse. But that database is a pain to use. Over the past few days I've been playing with the quick and easy FAOSTAT version 3, and I am really thrilled with its interface, and the range of data it provides. I hope it's good data -- it seems to match with other sources I'm using -- but what I especially love about it is the ease of queries on production and trade. Want to know where the Chinese sugar project in Benin exports its sugar? Bingo! (Portugal, France -- not China). Want to know if China exports rice to Mozambique? Bingo! (yes). I know, this is all impossibly nerdy, but what a great job FAO is doing with making their data on food accessible. UN-COMTRADE: "eat" your heart out. A Title for My New Book? OK, here is where I really need some help from readers. I am down to the wire on a title for my new book on Chinese agricultural investment (or not) in Africa. I had what I thought was a great title, Feeding Frenzy, which would play off of the general perception that the Chinese are leading the land grab in Africa, to grow food to ship back to China. (There is little evidence of any grand strategy to do this, let alone of Chinese farms in Africa growing food for China -- at least for now). Then, a few months ago, someone else published a book with that title. It's about the global food crisis and not about China and Africa, but my publisher (Oxford again), emailed me on Friday: "Ok - we're at the finish line for titles. We need one asap (for the catalog). Feeding Frenzy is taken and doesn't work." They proposed The African Rice Bowl: China, [Global] Food Security, and the Agricultural Revolution in Africa [or African Agricultural Revolution]. Hmmmm ... this doesn't work for me. It's too much of an echo of other writers who have argued the thesis I am going to dispute, i.e. that China does want to make Africa into its rice bowl. Update, October 10: Oxford has decided to go with Will Africa Feed China? -- no subtitle, but the cover will have a blurb or other written material that makes the point about the myths and realities. They liked the link with Lester Brown's famous 1995 book: "Who Will Feed China?" and the simplicity of the title which, they said, "says it all." So there we are. If anyone thinks this is really a problem title, please post! I still shudder to recall the original title selected by my last editor for The Dragon's Gift. They wanted to call it Rogue Donor? The book will be published at some point next year, probably in the summer. I am again looking for an excellent candidate to undertake Ph.D. research on China-Africa economic engagement under my supervision, to enter in the Fall of 2015. SAIS offers fully funded Ph.D. fellowships. Candidates must already have an MA degree, ideally in development studies, economics, or international relations. The ideal candidate will have some background in China-Africa relations, fluency in Chinese including the ability to read Chinese, field experience, and excellent English. Admission will depend on academic excellence (high GPA, excellent GRE scores), and a convincing statement of research interests that includes China's going-out engagement in Africa, broadly defined. This year I am particularly interested in candidates with interests in infrastructure, mining, and development finance. Quantitative skills (econometrics), Portuguese or French would be assets, but not required. The deadline for applications is December 15. For more information, and to apply, consult the SAIS Ph.D. program website here. Over the past couple of years I have been hard at work on a new book focused on China's agricultural investments in Africa. Some are very hard to track down. China State Farm Agribusiness Corporation (中国农垦)'s Togo Agriculture Development Company Ltd. for example. They reportedly developed a small-scale mixed farm offering demonstration and technical services in modern aquaculture, poultry, and pigs in an alluvial area 30 kilometers north of Lomé, according to a paper by J. R. Chaponniere and Zheng Qi, but as of 2014, we have not been able to find a trace of it. China in Zambia: "On-Par with Industry Averages"? CIFOR -- The Center for International Forestry Research -- has just published another paper in its series on Chinese investment in Africa: George Schoneveld, Laura German, and Davison Gumbo, "The developmental implications of Sino‑African economic and political relations: A preliminary assessment for the case of Zambia." CIFOR does great, very solid work, and this team is particularly good. I have enjoyed and profited from their studies for years. contrary to popular perception, China's direct participation in other primary sectors, such as forestry and agriculture, is negligible. Chinese investments have ...led to a rehabilitation of dilapidated mining infrastructure, while enhancing the country's production capacity through the construction of new processing facilities and the development of greenfield mines. These investments have proven to be more stable and less subject to commodity price fluctuations than their Western counterparts. Moreover, while Chinese investors are widely criticized for their poor corporate performance, on most labor-related and environmental dimensions, Chinese mines perform on-par with industry averages. "Early evidence appears to contradict many of the long-held assumptions about Chinese economic and political participation in resource-rich countries." Although the CIFOR report does not cite the Human Rights Watch study of Chinese mining in Zambia, it will be interesting to compare the two. I predict that CIFOR will get little publicity for their report -- compared with HRW. A h/t to Christian Straube. Will China Be Buying African Rice? Recently colleagues at Devex published a story about what China's move away from grain self-sufficiency means for African agriculture. Curiously, they illustrated this story with the photo and caption above, of a pile of 50kg bags of rice ... coming INTO Senegal. Devex said these imports are from China. As the Ameropa label shows, this is unlikely. Ameropa is a Swiss multinational with a branch that specializes in importing Asian rice for African markets. The rice in this photo was probably sourced in Vietnam or Thailand, not China. As our recent SAIS-CARI conference on Chinese agricultural investment in Africa pointed out, China is not exploring ways to feed its growing population using food grown in Africa. At least, not yet. I wrote my first book analyzing the problems and challenges faced by Chinese rice projects in West Africa (Chinese Aid and African Development, 1998), so this is a special interest of mine. Here's what is going on in Senegal -- excerpted from an excellent analysis by Adama Wade at Financialafrik.com. Senegal, with 13 million inhabitants, is the world’s tenth biggest importer with 700,000 to 900,000 tonnes per year. ... « It is strange that the rice produced in central Vietnam, transported to Ho Chi Min Port, loaded in bulk and shipped to the ports of Abidjan or Dakar, landed and then transported by road to Bobo Dioulasso or St. Louis is preferred by the population and is cheaper than local rice», wonders aloud an operator, formerly shareholder of Glencore International. ... Local production accounts for 200,000 tonnes of paddy rice, the equivalent of 140,000 tonnes of local rice. The Government’s goal is to reach 1 million tonnes by 2015, including 800,000 tonnes produced through irrigated rice. The Senegalese Government has made ​​food self-sufficiency its key priority. But, there are still some inconsistencies. More tax incentives are given to investors who make 80% of their turnover from exports. Amazing! This is just the tip of the iceberg- while Asian producers receive subsidies on energy, water and fertilizers, in the Senegal River Valley, support mechanisms remain elusive. So, there are no energy subsidies for rice production and development (offset). Urea, which was subsidised by 50% between 2006 and 2011 and sold at CFAF 6,000 now costs CFAF 9,000. Although the price of DAP actually decreased, the quantity available barely covers half of the requirements. There is an energy challenge in the processing of local rice.«There are fixed monthly electricity costs. Whether you work or not, you pay CFAF 250,000 a month.» Under such conditions, can local rice sold at CFA 12,500 mill price (12,500 for whole grain rice) be competitive and generate enough income for a quantitative and qualitative leap? Adama's analysis makes it clear why the Chinese are not likely to be coming to Senegal for their rice. When it comes to that -- if it does -- they will go to Vietnam. Just as the Senegalese do. China's second foreign aid white paper published -- finally! Last summer, we started hearing that Chinese analysts were working on the second white paper on foreign aid. It has been many months in the works, and unexplicably delayed for months, but now, at last, the second White Paper on Foreign Aid has been published. It is much less detailed than the first, and perhaps that reflects the triumph of whatever concerns delayed it. Here's what's interesting. These figures do not include additional funding (over $1.3 billion) provided through the UN and multilateral and regional development banks over this period. According to the paper, 51.8 percent of Chinese aid goes to Africa. This means an average of $2.5 billion per year between 2009 and 2012. China is also still providing debt relief in Africa. Nine countries: Tanzania, Zambia, Cameroon, Equatorial Guinea, Mali, Togo, Benin, Cote d'Ivoire and Sudan, had 16 mature interest-free loans cancelled, for a total of 1.42 billion yuan ($229 mn). This continues the practice begun more than a decade ago of loan cancellation only for the interest-free loans. Countries thinking they might have their concessional loans cancelled need to think again: concessional loans have never been included in the loan forgiveness program. The "Chinese Peace Corps" is still alive, with some 7000 volunteers sent abroad over the past three years. Why do we hear almost nothing about this program? Has anyone run across a volunteer in Africa? Another interesting development: China is providing some assistance to Burkina Faso, a country that recognizes Taiwan. This is done as part of a WTO-related program, where Benin, Mali, Chad and Burkina Faso -- the Cotton-4 countries -- receive cotton seeds, farm machinery and fertilizers, technology transfer and training, and support for other aspects of their cotton value chain. Cotton is probably the top agricutural export from Africa to China, so this clearly shows economics trumping politics. A hat tip to Winslow Robertson who was even faster than my google alert to pick up news of the White Paper! On debt sustainability, an official from the IMF confirmed: "The Chinese look at debt very differently [from the IMF]. It's a function of the project investment." He noted that the IMF Board has had "intense debate" on the debt limits policy (a post-HIPC innovation). "The debate has been heavily influenced by the way China has been approaching Africa. And that's all to the good." A World Bank official working on the China-Africa relationship noted that the World Bank signed an MOU with China Eximbank in 2007, but nothing really resulted. Now, the World Bank has two new MOUs, one with China Eximbank signed in September 2013, and the other with China Development Bank, signed in June 2013. They may co-finance a project in South Sudan using World Bank standards [DB: we'll see about that, given the fighting there...]. An official from Kenya noted, "It's still early days" in this relationship, but "China is the most pragmatic development partner operating in Africa today." Someone related a story about Chinese pragmatism. A delegation from Tanzania went to Beijing with a list of vague ideas amounting to $10 bn. The Chinese looked at the list and said: "There are no bankable projects here." Our panel had many of the same old questions about neo-colonialism, do Chinese import all their own workers, are they the largest investor, positive/negative influence, African opinion, and so on. An important point concerned procurement practices. Many Chinese companies are getting contracts on a no-bid basis. This tends to inflate costs. Competition is good. Transparency is good. At last, a team of experienced researchers with extensive experience on official development assistance (and foreign aid), and with deep background on China, the OECD, and the Asian approach to aid and cooperation more generally, has come up with an estimate of China's total annual official development assistance (ODA) in 2013 of $7.1 billion. This fits well with the latest glimpse into official figures, when a Chinese official let slip in April 2013 that China's official aid was about $6.35 billion, and with my own estimates. I highly recommend their paper: "Estimating China's Foreign Aid, 2001-2013 JICA-RI Working Paper No. 78, June 2014. Lead author Naohiro Kitano and his colleague Yukinori Harada have done a superb job. The methodology is carefully worked out and fully explicated. One of the gnarly questions in estimating Chinese aid is how to treat subsidized (preferential) export credits, which like everything else out of the Chinese policy banks, seem to be growing rapidly. Kitano and Harada follow the method required by the OECD's Development Assistance Committee (DAC), which states that export credits, no matter how concessional, cannot be considered -- by definition -- official development assistance for DAC members, as their main purpose is the promotion of a country's exports. Of course they can be counted as foreign aid, just a military aid is foreign aid. But to be comparable with the OECD countries, neither of those two should be mixed up with ODA. From what I can see, the Chinese also follow this recommendation. Though many in China do not understand the difference between the two (this is also true for many in the OECD), the budget lines that subsidize the two different loans (concessional foreign aid loan, or "you hui dai kuan" and preferential export buyer's credits, or "you hui mai fan xin dai") are also separate, and only one, concessional foreign aid loan, is included in Chinese announcements of their foreign aid. "200,000 Ugandans have signed up to a company believing it will cure all their illnesses and help them make a fortune. But it is more likely to do the opposite." This is the kind of balanced, important, deeply researched reporting that China Africa specialists long for. I particularly like the interview with an authentic Chinese doctor who is at first amused by the claims being made and then, as he learns more, genuinely alarmed by their implications. Reported by James Wan. Another great effort supported by South African Wits University's China-Africa Reporting Project. 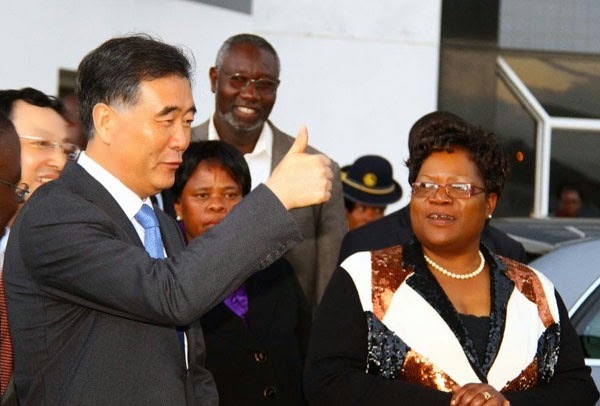 China: Exempt from Zimbabwe's Indigenization Policy? In southern Africa, many people believe that Chinese companies are exempt from the indigenization policy in Zimbabwe -- a requirement that firms submit plans as to how they will achieve 51 percent Zimbabwean ownership over a set period. I don't think Chinese firms have a blanket exemption. True, I have read that the tobacco buyer Tian Ze -- which has been working with indigenous Zimbabwean tobacco farmers in a contract farming arrangement, supplying inputs and credit, and purchasing their crop -- was given an exemption. 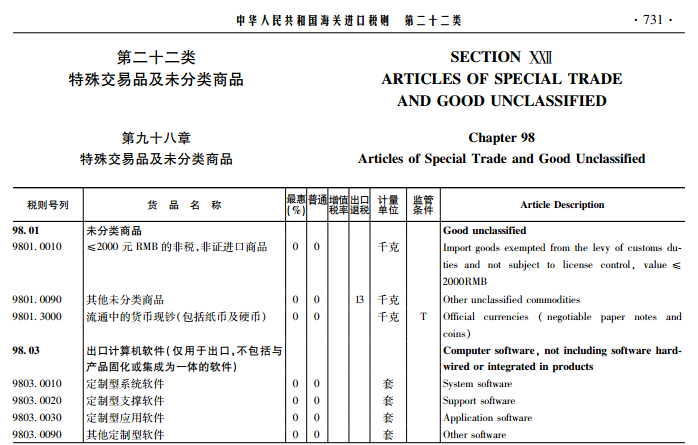 There may be some other Chinese companies that have negotiated exceptions just as some other foreign firms have been trying to do, but despite the oft-stated "Chinese are exempt" belief, the evidence suggests that Chinese firm have no blanket exemption. "Zimbabwe's Indigenization and Economic Empowerment Act "(2010 Amendment) and Localization and Economic Empowerment Ministry No. 66 File 2013" provide that commercial activities in the reserved sectors must obtain localization certificates before January 1, 2014. Businesses are required to submit proof of localization options or plans. Failure to comply will be punishable by a fine, 3 to 4 months imprisonment, or both. The Chinese Embassy in Zimbabwe reminds those Chinese citizens engaged in reserved sectors, including retail and wholesale, to fully understand and comply with the relevant laws and regulations in time, in order to avoid unnecessary trouble and losses. The 14 sectors include: 1. Agriculture: food and cash crops of primary products; 2. Transportation: passenger buses, taxis and car rental services; 3. retail and wholesale; 4. barber shop, a hairdresser and a beauty salon; 5. Employment Agencies; 6. Real estate agent; 7. valet service; 8. grain milling; 9. bakery; 10. tobacco grading and packaging; 11. tobacco processing; 12. advertising agency; 13. milk processing; 14. The local art and handmade products marketing and distribution. Comments on the website reveal a lot of confusion about the policy and how it will be implemented, but the message from the embassy is consistent: obtain your localization certificate in time or risk fines and imprisonment. Here in Washington, I am asked a lot by people at USAID and the World Bank: why is it so hard to cooperate with China in Africa? Usually the person asking the question has in mind doing a foreign aid/development project together. It's not always clear exactly what the purpose of such cooperation is -- and I suspect that usually the subtext is "we need to teach the Chinese how to be better donors." I am collecting examples of US-China-Africa cooperation that already exist. Usually these are commercial deals where cooperation has a business rationale. This is an excellent, and more sustainable way to go. China, Ethiopian Airlines to finance purchase of Boeing Aircraft by reporter Kaleyesus Bekele: This deal is still at an early MOU stage, but as the article notes, if it goes forward, it would involve a financing facility of $500 million from China's largest bank, ICBC, provided through a leasing vehicle, to Ethiopian Airlines, so that they could buy Boeing aircraft. Boeing, a US company, and China are "old friends". According to Boeing, more than 50 percent of the commercial jetliners operating in China are Boeing airplanes. Apparently ICBC has already been involved as a junior partner in another aircraft financing deal for the B777-200LR freighter in Ethiopia. This marks additional maturing of the China-Africa financial relationship. And it's the kind of tripartite cooperation that's likely to endure. If anyone knows of other examples like this, please contribute. A h/t to the Centre for Chinese Studies, Stellenbosch University. According to the Financial Times, the Chinese and the Africa Development Bank will soon announce a contribution of $2 bn to an Africa-wide investment vehicle, "Africa Growing Together Fund." Unlike most Chinese finance on the continent, this would be open to all companies to compete. If it's true (and it is still to be confirmed), this is a huge change and a very welcome one. While the multilateral banks are not immune from corruption and embezzlement challenges, they do have stakeholders that try to hold them accountable in a transparent process. That has not been the case with the Chinese policy banks. I suspect that Chinese firms will still win the majority of contracts but what an excellent tactic by a maturing Chinese leadership to make them compete internationally for their wins. This kind of competition is how companies become excellent, not by having deals handed to them, or by winning through collusion or non-competitive means. I can't wait to learn more. Mysterious Chinese Imports from Africa? UPDATE April 28, 2014: A paper by Africa trade expert Dr. Ron Sandrey, "Assessing South Africa's Trading Relationship with China," also raises questions about this strange gap in data for South Africa's exports to China. He wonders if perhaps it represents exports of gold (although China is itself one of the largest gold producers in the world). Chinese trade experts, do weigh in! The Paul H. Nitze School of Advanced International Studies (SAIS) SAIS China Africa Research Initiative (SAIS-CARI) will hold an inaugural public conference: Researching China’s Agricultural Investment in Africa: ‘Land Grabs’ or ‘Friendship Farms’? 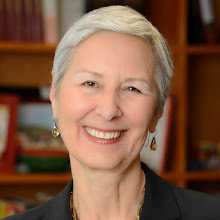 May 16, 2014 and private research workshop on May 17, 2014, in Washington, DC at Johns Hopkins University’s School of Advanced International Studies. The goal of the conference is a deeper, comparative understanding of the motives and experiences of Chinese investors; the network of relationships: investors, governments in China (national and provincial) and in Africa, intermediaries and brokers; and the impact of their investments. We are pleased to welcome an international group of experts from China, Mali, Mozambique, the Netherlands, the UK, South Africa, Spain, Uganda, France, and the US, presenting on a number of cases: Philippe Asanzi, Centre for Chinese Studies, Stellenbosch University (DRC and Mozambique), Deborah Brautigam, Johns Hopkins-SAIS (various), Lila Buckley, International Institute for Environment and Development, London (Senegal tbc), Xiaochen Chen (Tanzania) Sérgio Chichava, Instituto de Estudos Sociais e Económicos, (Mozambique), Solange Guo Chatelard, Max Plank Institute (Zambia), Jiao Yang, University of Florida (Ghana, Nigeria tbc), Josh Maiyo, Vrije Universiteit Amsterdam (Uganda), Margaret Myers, Interamerican Dialogue (China in Latin America), Nama Ouattara, Université Paris-Sud (Mali), George Schoenveld, CIFOR (various), Xiaoyang Tang, Tsinghua University (Malawi), Henry Tugendhat, IDS-Sussex (various), Eckart Woertz, Barcelona Centre for International Affairs (Gulf States in Africa), Xiuli Xu, China Agriculture University (Tanzania), Jinyan Zhou, Chinese Academy of Social Sciences (Angola), and others still to be confirmed. Data and details: why did the land grab databases get it so wrong? The business model behind China’s agro-technology demonstration centers. The conference is free, and open to the public, although seats are limited. We will open Eventbrite for tickets one month before the conference date -- link will be at the website of the SAIS China Africa Research Initiative SAIS-CARI. To reserve a seat in advance, or to request an invitation to the private researchers workshop, please email: SAIS-CARI@jhu.edu. Anyone who has been to Luanda knows that the city lacks housing. The hotels are extremely expensive, and researchers have been known to rent a room in someone's house for $100 a day. Angolan president Jose dos Santos pledged to build a million new homes, between 2008 and 2012. Kilamba City was part of that promise. The idea of constructing a new town, Kilamba City, 20 km outside Luanda, where flats would be available for purchase, seemed like a good one. A Frenchman, Pierre Falcon, the famous architect of the "Angola-gate" arms trade and corruption scandal, owns the company that oversaw the project: Pierson Capital Group. The complex was financed by ICBC, Industrial and Commercial Bank of China, allegedly backed by oil-revenues. CITIC built the flats. The state-owned oil Angola was in charge of marketing the apartments (they would use those revenues to repay the loan). Chinese firms built Kilamba. And then the apartments seemed to stand empty. Visiting Western journalists photographed the long, lonely expanses of buildings. Kilamba City was filled, it seemed, by ghosts. Until recently. Or so it seems. 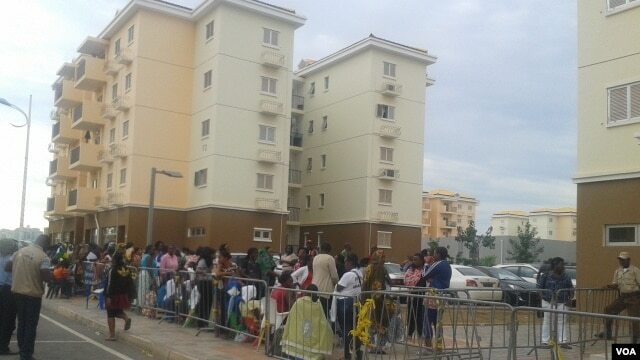 According to the official Angolan news agency, some 40,000 people moved into Kilamba after their families took advantage of long-term, low-cost mortgages to buy flats with prices ranging from US$70,000 to US$140,000. One account said people are standing in line for days to buy one (photo left). The news stories on Kilamba, the "ghost town" mainly date from 2012. If it is actually now becoming a thriving town, why hasn't anyone gone back to report on it? Readers: have you seen Kilamba? Your comments and stories are very welcome. Update May 6, 2014: New SAIIA analysis exactly on this topic, by David Benazeraf and Ana Alves, "Oil for Housing: Chinese-Built New Towns in Angola." Highly recommended.